Ever wondered why tread patterns are opposite for the front and read tyres of a motorcycle? That’s because the rear wheel propels the motorcycle forward and hence twists in a way to “push” the tarmac behind. Although the front wheel doesn’t play a role in propelling the motorcycle forward, it does most of the work while braking by effectively “pushing” the tarmac in front. So these primary forces work in opposite directions. 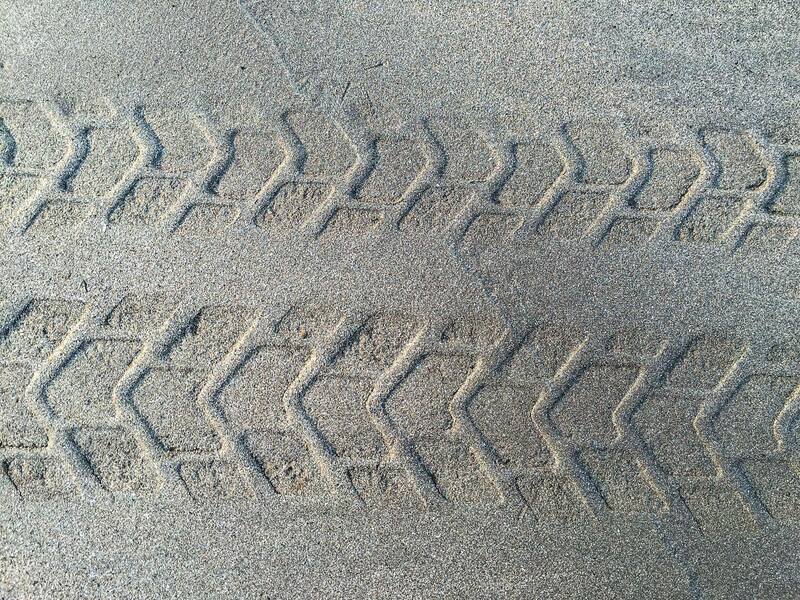 Modern complex tyre tread patterns are designed to be more effective in one direction, which is why you can see the treads that this pair of Pirelli MT60 tyres made in the sand look opposite to each other. This is why it’s very important to mount a tyre as specified by the rotational arrow marked on its side wall. Tyres that are symmetric in tread pattern don’t come with rotational arrows and can be mounted in any direction.